For this card I used a little cream shop bought scalloped edge card and I cut layer of burgundy card and a matching layer of cream card. I marked the centre of the cream layer and using my ribbon for placement, I lined up the patterned die out of my header die set from the Art Nouveau Collectables set before placing the outer edge die which I like to cut first. I repeated this to cut the other side then cut end embossed the pattern die into both sides. This patterned piece of card was glued centrally onto the burgundy layer and the ribbon was added before the layer was stuck onto the card front. 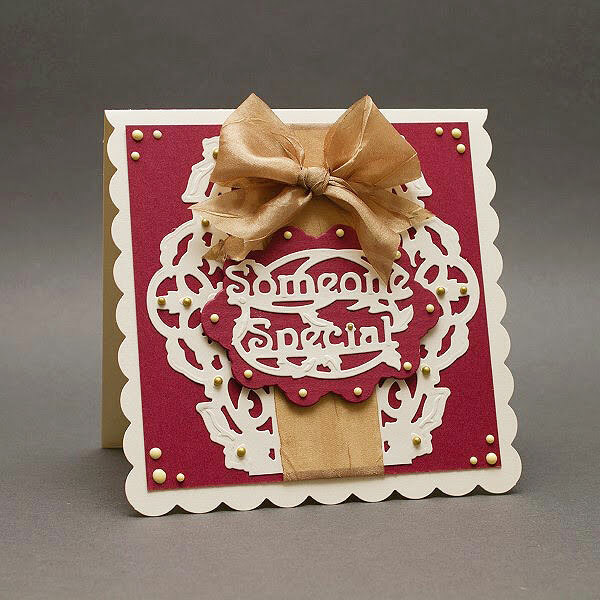 I cut the small oval from the Loopy Lace Ovals die set from matching burgundy card then die cut the someone special sentiment from the Art Nouveau set from cream card and glued these together. This was stuck onto the card front with 3d foam. This card was finished with a big hand tied bow and some Nuvo Crystal Drops in Buttermilk.